On April 3 1998 the long-awaited Lost in Space movie invaded U.S. theatres, toppling James Cameron's "Titanic" from its first place berth for the first time. To coincide with the film's release FAO Schwarz, New York City's premiere toy store, transformed its entrance and one special section of the store into a Lost in Space showcase, featuring toys from the film as well as a nod to the classic series. 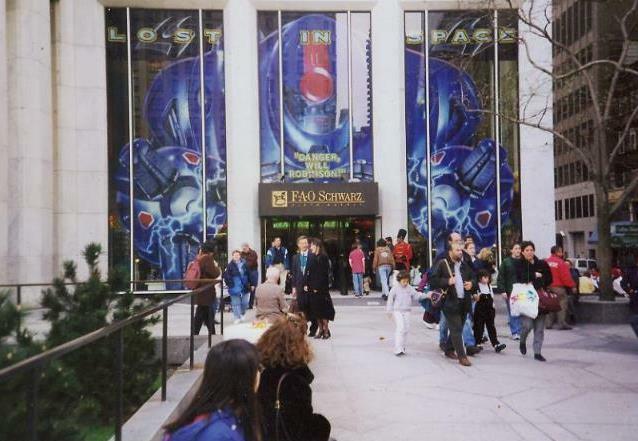 Images one and two show the front of the store, featuring a three-story high transparent decal of the movie robot to welcome shoppers ("Danger Will Robinson!"). Images three and four were shot inside in the "Lost in Space department" , mostly movie toys (love that transforming blaster!) with the Polar Lights classic LIS models and a talking robot T-shirt thrown in for good measure. Notice the bright blue bulkheads constructed especially for this event. Images five, six and seven show the enormous life-sized movie robot display inside the store. This was not the actual prop used in the film but a fiberglass and resin model. also created for this extraordinary event. After shooting these images, much to the bewilderment of the shoppers, I did not want to leave!